> What are the best conditions for keeping and breeding A.cruzi? I was surprised to find out the the water measured a pH of 7.6 to 7.8. However, this species will tolerate and breed at a much lower pH. wouldn't worry about changing your water. > the common collection sites of this species? let the Mom any where near them. 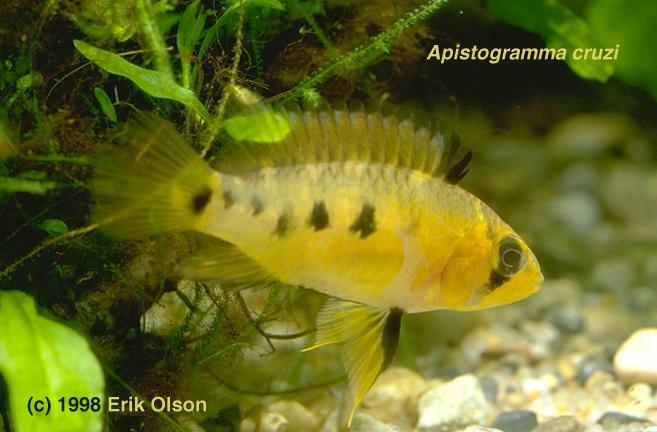 That's it, it's an Apisto conspiracy!!!. >>> time in a row. >>> soft (dont know how soft, 80% RO), 81 F, lots of hiding places. >Just give them some time. Sounds like they are inexperienced. Good luck. 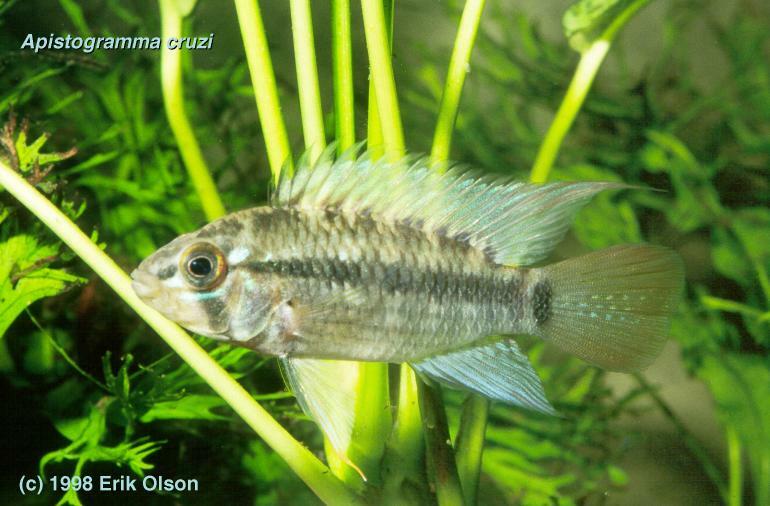 about 50 A. cruzi which can be acquired as pairs or juveniles. 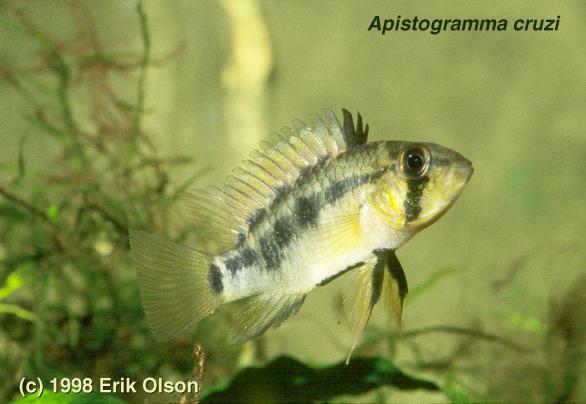 apisto A.cruzi. Female spawned several times, but all eggs became bad. I started to suspect she has sort of mental problem, and I was wrong! floor, and moved it to the entrance, untill the entry was 0.25 of an inch. She could slide in only on her side, and male could not slide at all! fish addition, agreed to ADD another male, not exchange them. day new male decided he can go out and so he did. next day and only one was bad. Male continues to visit females' caves. male was beaten up pretty badly after each spawn. ~60 eggs, they are all fine and I expect them to be wrigglers tomorrow! they are eating like little pigs (lot and messy). start baby BS tomorrow. Wish me luck! with some babies and they are fun to watch! >1. Do they breed in pair, trios, or both? 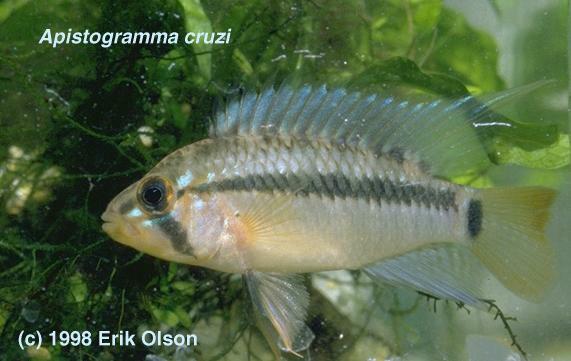 Gamitana (Pacu) farm that had entrapped some A. cruzi and A. cacatuoides. Here the water temperature was also extremely high, reaching 93.4F at noon. That's right 93.4F!!! Interestingly most were males. >is amoung the easier to breed, do you agree? also in moderately hard ph 7.6 water. I stopped the bbs. I will start some now. have liquifry and the tetra baby fish food. with water and squirt it from an syringe. some small 1.5 and 2" flower pot in.